It is Sunday night, and like most people, I’m lamenting the fact that the weekend is winding down and the work week is beginning again tomorrow. However, it’s even harder this Sunday because I’m coming back from Spring Break AND I came down with a cold yesterday. Oy. On the bright side, I went to plenty of trucks during this break, and four of them were trucks I had never been to before. Without further ado, I’d like to introduce you to the four new trucks I tried during this Spring Break. I visited my first new truck during lunch on Monday. I was eager to do some daytime truckin’ and the fact that Kaati Fresh was out when I hadn’t had a chance to try them before made me quite pleased. I headed to their location at Ebay and joined the line. I was excited to see so many vegetarian options on the menu, but as I made my way to the front of the line, news started to spread that they were out of most of their items. 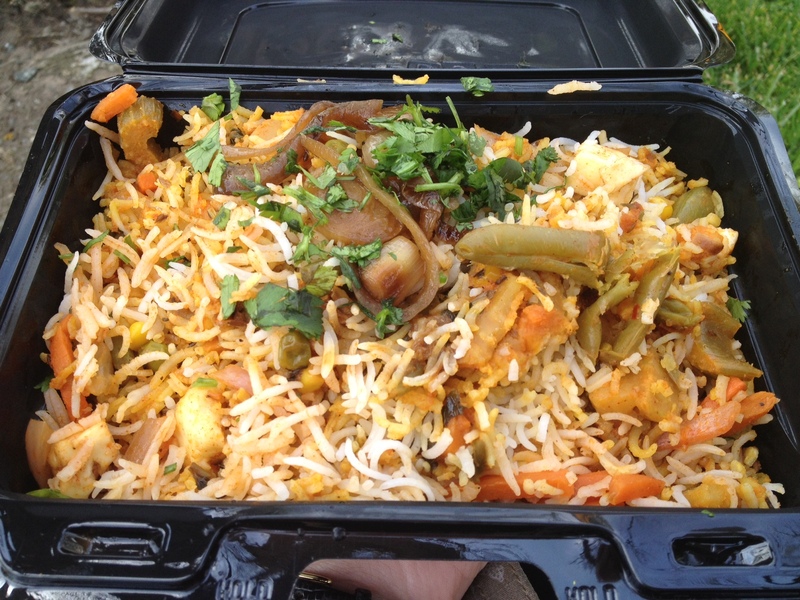 When I ordered, the only veg option left was the vegetable biryani. The workers hadn’t bothered to cross off any of the menu items that were sold out like most trucks do. They also had a different way of handling orders in that they didn’t expect customers to pay when they ordered their food and instead asked for the money at the time of pick up. I’m curious as to whether this is more efficient or not. Regardless, the wait both to take my order in the first place and to get my food once I ordered was rather long. By the time I got my food there were many frustrated people outside since only two menu items remained, and the service was not going any faster. 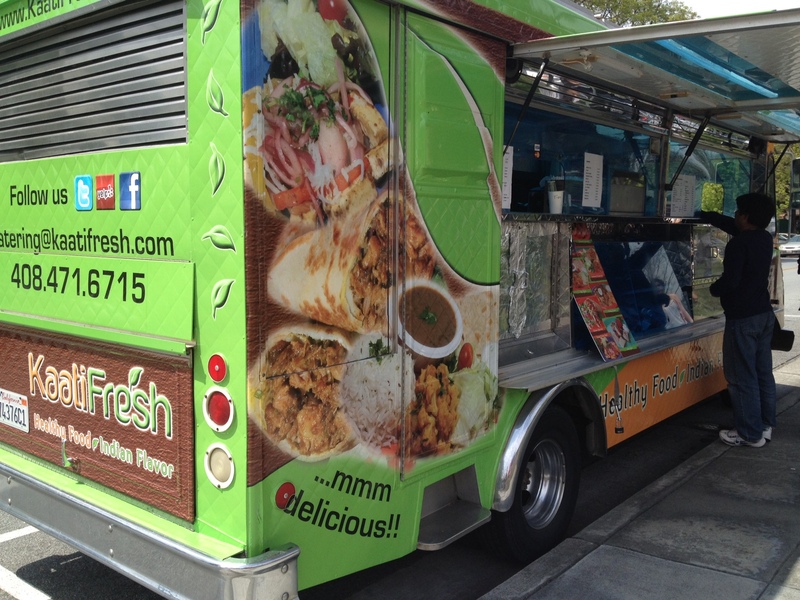 I’ve heard that Kaati Fresh has a few brick and mortar restaurants, and their truck doesn’t seem to be out often, so I’m thinking they still have a few kinks to work out in their system. On the plus side, the meal I had was very tasty. I was full before I ran out of food, and it only cost six dollars. I’m hoping once the truck has more experience out on the streets their service will measure up with the quality of their food. On Tuesday night, I ventured to Edgewood Eats as I normally do. This time, however, they hadn’t posted on their facebook page which trucks would be there. I only knew the event was taking place because a truck had tweeted it would be there. I was surprised to find when I showed up that there were two new trucks. 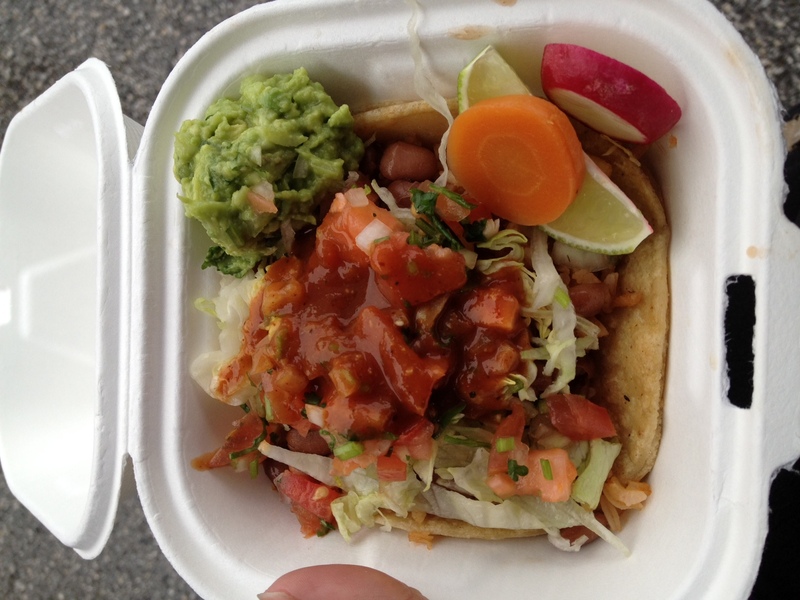 I made a beeline for the first of the two, Taqueria Angelica’s. 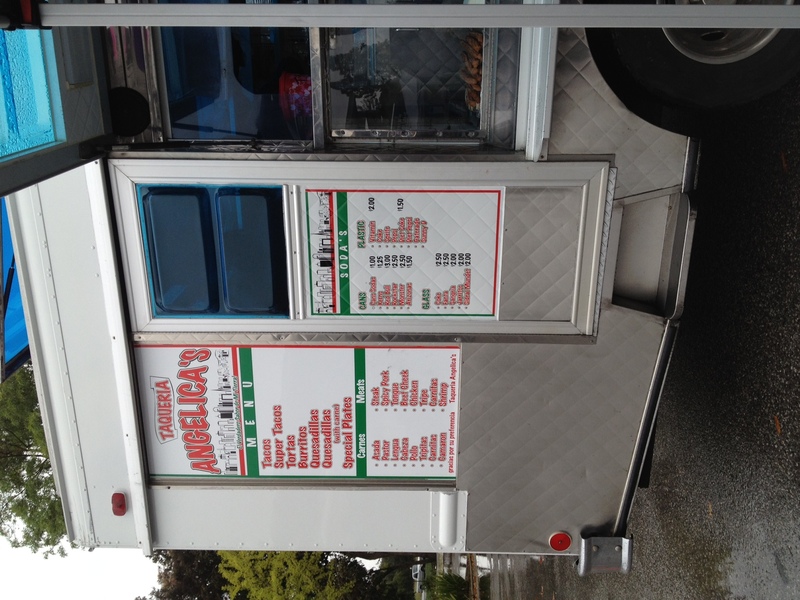 Since I had looked at the menu for the other new truck and knew I’d be getting a larger portion there, I decided to just have a taco at Angelica’s. They didn’t have a veg taco on the menu, and the prices only listed tacos sold in twos. However, they were very accommodating when I asked for one vegetarian taco. 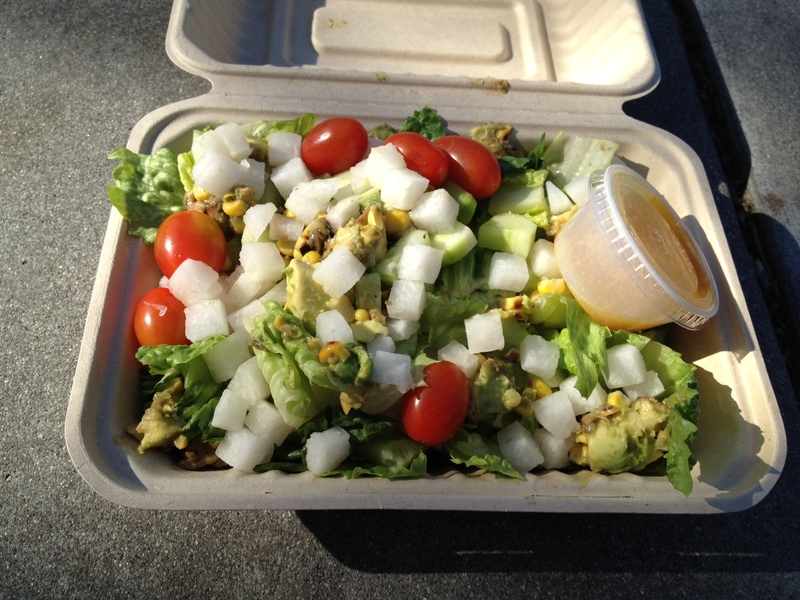 The result was rather yummy with lots of toppings; I especially enjoyed the guacamole. 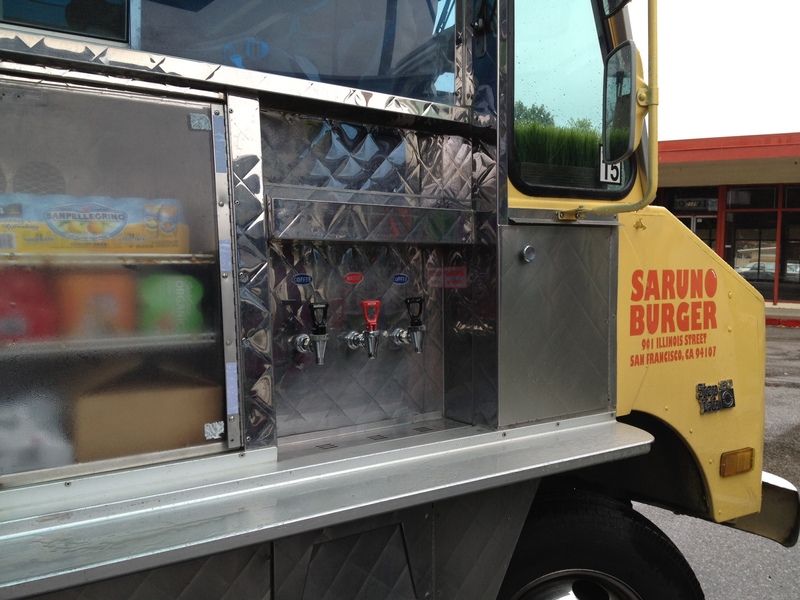 The next Edgewood Eats newcomer was Saruno Burger. 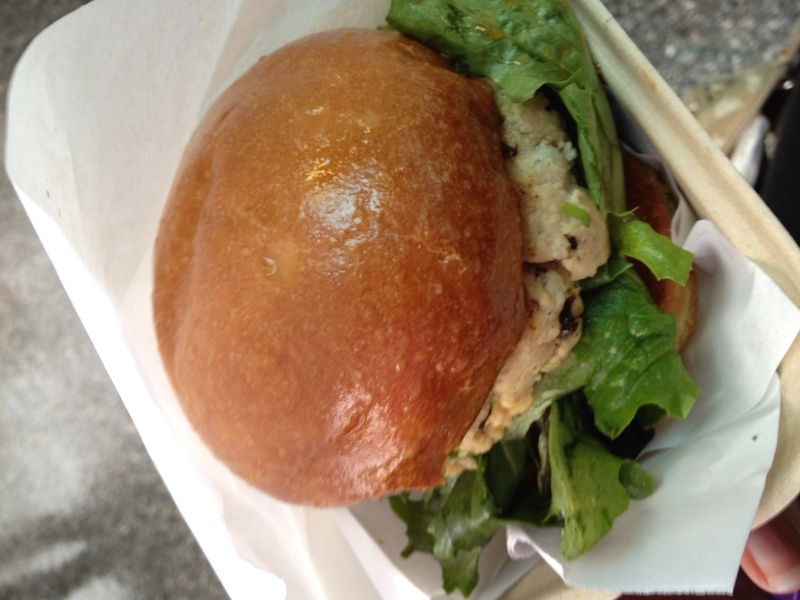 When I saw the word “burger” I assumed there wouldn’t be anything for me at the truck but was pleasantly surprised when I saw a tofu burger on their menu. The wait was a little long for a rainy day with few customers, but the meal was worth it. The tofu crumbled easily, causing the burger to fall apart completely, but I used a utensil to make sure I consumed every morsel. My final new truck of the week didn’t take place until today. I had been following Baba Kabob on twitter for a few weeks and waiting for my Spring Break to give them a try since they seemed to only sell at lunch time. Then, they unexpectedly stopped tweeting this week! They were rumored to be attending Milpitas Street Eats on Wednesday and didn’t show up. Then they started tweeting again yesterday, but I was, of course, at the Taco Festival instead. 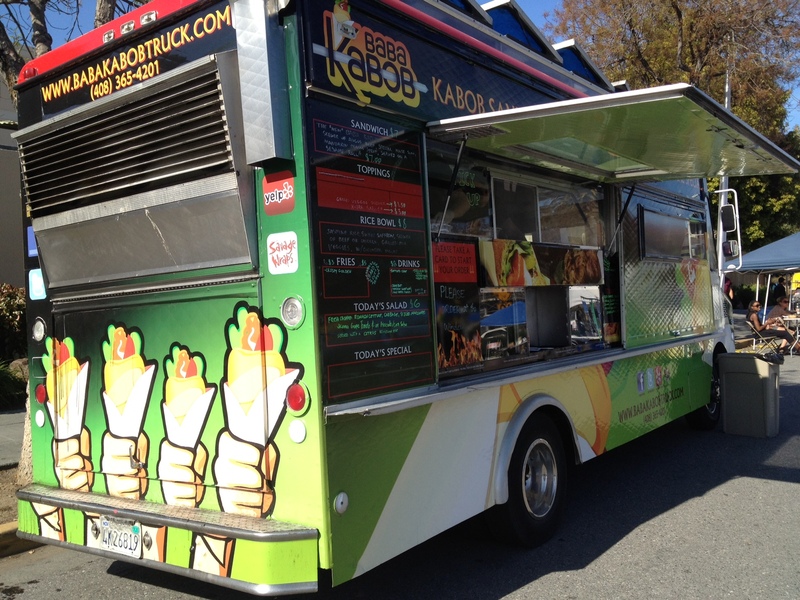 Finally, I caught up with the elusive Baba Kabob truck today at Santa Clara University where they were serving at an international fair. Kyle and I arrived twenty minutes before the event was scheduled to end, and as you can see in the photo, one of the doors on their truck was already down. Luckily, they were still happy to serve us, and they had a couple veg options left! We ordered two of their vegetable skewers and a salad. Since they were about to close down anyway, they gave us another skewer free of charge. We thoroughly enjoyed both items. 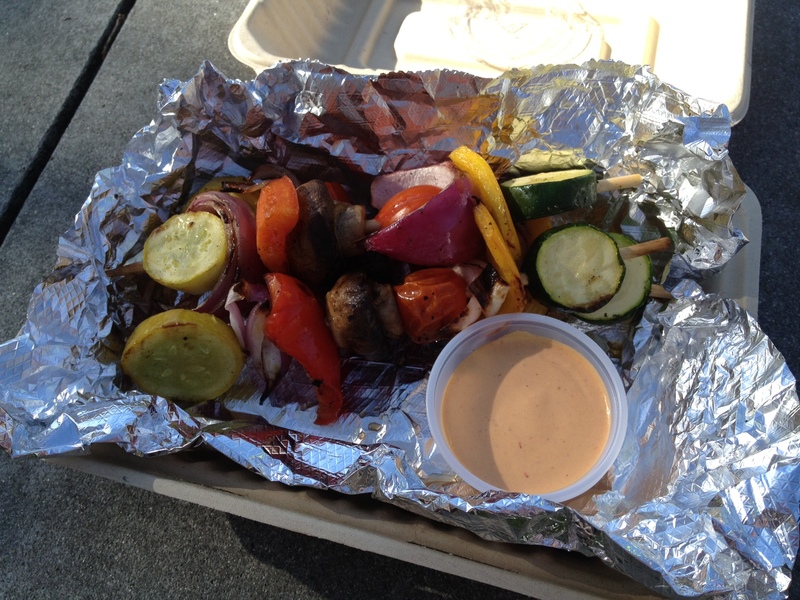 The highlight was probably the condiments – the dipping sauce for the skewers and the dressing for the salad. The vegetables in both were also very fresh and flavorful. Tomorrow I return to work, but I hope this won’t mean as few posts as it recently has. Since I’m sick, I might take a day off of work this week to catch up on rest and recover. If that happens, I will use that down time to write my post about the Taco Festival yesterday. Until then, you can check out Kyle’s photos from the event here to tide you over.